Shorewood never trailed rival Shorecrest in the Wednesday, April 3rd baseball game, but at times it felt closer than the 3-7 outcome for the home team T-birds, in a 6-1/2 inning game played under overcast skies and a steady wind blowing out to centerfield. The difference in the score undoubtedly was Shorewood’s timely hitting and aggressive base running, especially from seniors Simon Shutts (3-for-3) and Kevin Hirohata (2-for-3). The pair combined for 5 hits, including a triple, 4 runs, 3 stolen bases and 5 RBI’s. 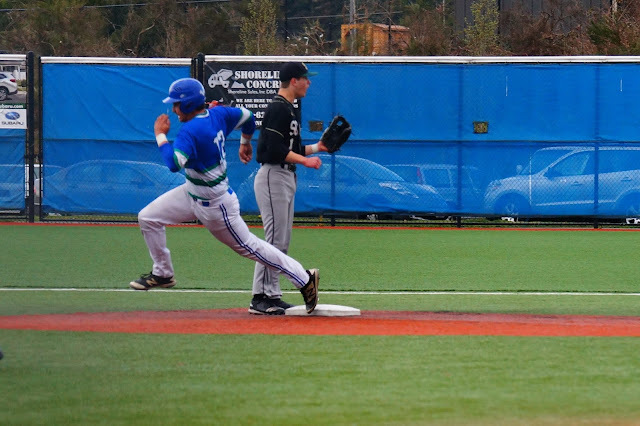 Coach Wyatt Tonkin’s varsity squad was highly successful in driving Shorewood base runners, like junior Sam Mainwaring and senior Brandon “B-train” Main, across the plate, which is something the T-birds failed to do in the series opener Tuesday night at Shorecrest. The Scots won that match up 0-1. Shorewood quickly proved they could score runs, jumping to an early 3-0 lead in the second of a two-game series. Shorecrest didn’t blink and tied it up 3-3 in the 5th, knocking senior starting pitcher David Snell out in the process. The home team re-took the lead in the same inning, and never trailed again. The Scots threatened again in the 7th, getting a pair of walks to put two runners aboard. After witnessing a trio of relievers, including senior Ian Brown (0 BB and 1 K), an error-free defense, featuring an uproarious, game ending double-play, the fans rewarded their boys’ victory with a spontaneous rendition of the “Shorewood Fight Song”. T-Birds ended their week with an at-home win over Mountlake Terrace on Friday, April 5th. The 1-8 game, played in a lucky break in the wet weather, was a solid performance by junior Bryce Lindberg. He pitched a complete game, with 4 strikeouts and no walks. Good defense helped Lindberg's efforts by playing 7 error-free innings. Shorewood's next matchup is at Mountlake Terrace on Tuesday, April 9th, followed by an away game at Edmonds / Woodway on Wednesday, April 10th. The T-Birds are back at home at the Meridian Park "Birdcage" on Friday, April 12th versus Archbishop Murphy. All game times are 4pm.